France, 8211. First edition. Disbound. 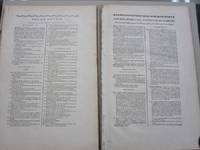 This listing constists of several groupings of pages containing plates and descriptions of those plates which were removed from the first edition of Diderot's Encyclopedia. Pages measure 39 x 27 cm which are still bound together in signatures. Full page and two page plates. Description of each signature follows: Potier D'etain (Tin) consisting of a description of 9 plates of which 8 our present. Plate I is missing of this group. Bound with this: Potier D'etain Bimblotier consisting of a description of 6 plates, all of which are present. Next grouping: Following this are 4 plates with no description page with titles like "Travail du Bas au Metier". Planche # III, IV, V, VI. Next Grouping: "Faiseur de Métier a bas, et faiseur de bas au métier". Constisting of a description of 11 plates of which the first plate is missing and the other 10 are present. Next Grouping: "Forge des Ancres" (anchor forging). Consisting of a description of 13 plates, all of which are present. Next Grouping: "Potier de Terre". Consisting of a description of 19 plates, all are present. Planche XVII is a fold-out plate titled "Potier de Terre, Fours". Final Grouping: "Draperie". Consisting of a description of 11 plates all are present. In general, the plates are in nice condition with no tearing. These are the plates with descriptions, no binding, and they are not a complete set. The original Encyclopédie was published in 17 volumes with 11 volumes of plates published by 1772. Later printings did not include them to cut down the costs and allow a wider audience to read the work. This was the first encyclopedia to describe the mechanical arts and also the first to include contributions from many named contributors. These include such famous enlightment figures as Voltaire and Jean-Jacques Rousseau. New York: Caravan Books, 1977. First edition. Hardcover. Near Fine. 24 x 16 cm. Small quarto. 319 pages. Blue cloth no dust jacket. From the preface: "This textbook of modern Western Armenian is designed as a first year course at the udnergraduate level. It is specifically aimed at students with no prior knowledge of Armenian, and emphasis has been placed on the numerous subtleties and nuances of Armenian which might seem strange or difficult to English speakers." 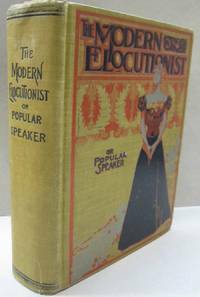 The Modern Elocutionist or Popular Speaker; A Manual of Instruction on Cultivation of the Voice, Gesticulation, Expression, Posing, Etc. Chicago: Thompson & Thomas, 1900. Hard Cover. very good. Fabulous design to front cover. 228pp Illustrated with theatrical photographs. A very nice copy. 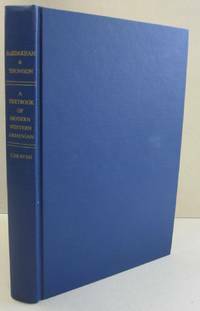 A Book for the "student of elocution"
Austin: U. of TX Press, 1971. vg+/vg+ dj. Sm4to, 187 pp. Light rubbing at head and tail of spine, small ink inscription on ffep.